“If I die here, throw dirt on me,” Roderick Rogers said when talking about the small, rural town of Fordyce, Arkansas. An ISS teacher and basketball coach at Fordyce High School, Rogers is determined to do whatever it takes to share Jesus with the souls in his hometown. Rogers is also pastor of Fordyce Community Baptist Church, a church plant that first began having services in May 2017. But Rogers and his church members were doing ministry long before May. Before the church was named Fordyce Community, it actually had another name: Lighthouse Church. Rogers planted Lighthouse Church in order to reach “the poor, low-income people from the other side of the tracks.” As it turned out, the need for such a church required more than Lighthouse was able to give. In the meantime, other pastors in the community and beyond the Arkansas Delta began to notice the Gospel seeds that Rogers was planting in Fordyce. And it was his hard, faithful work of four years that would lay the foundation for Fordyce Community. Rusty Ross, pastor of First Baptist Church Fordyce, was one of the pastors who noticed Rogers’ heart for missions. A conversation about initiating a church partnership and bringing Lighthouse Church into the Arkansas Baptist State Convention (ABSC) convinced both men and their congregations that they could better reach their community together. “It was God’s plan and God’s time,” Ross said. “It wasn’t really anything we were looking for, but God put this before our church.” He explained that First Baptist Fordyce has done missions all over the state and world, but that missions “right here in Fordyce” is very important to their staff and church members. Even before Lighthouse Church was replanted—this time through the ABSC—and renamed Fordyce Community, the two churches began doing ministry together, including starting a gym ministry and co-hosting a block party. First Baptist Fordyce also informed Geyer Springs First Baptist Church in Little Rock about their partnership. For Christmas, Fordyce Community had the idea to host a dinner for underprivileged kids and struggling families. They wanted to provide a ham and gifts for every family who attended. A few weeks before the dinner, the church stored their gift purchases at Rogers’ house. While he was away at work, someone broke-in and took the gifts. But the growing partnership is not solely centered around financial support. It’s about the relationship. Ross has also worked alongside Fordyce Community throughout their replant process. When a handful of Fordyce Community’s founding members—or core group—would meet to discuss the values and new direction for the church, Ross would counsel them. The church’s core values have changed since Lighthouse, Rogers said. They have put more emphasis on small groups “to train people up and make disciples.” Ross said he has been encouraged by this enthusiasm and heart for discipleship. 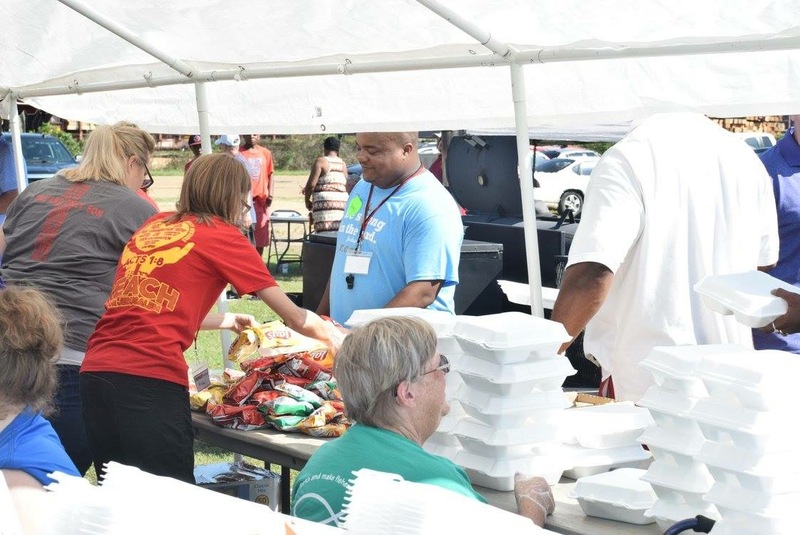 After a block party that Fordyce Community co-hosted with First Baptist Fordyce and Geyer Springs on August 5, a new wave of people began coming to Fordyce Community. Along with the help of Geyer Springs and the Carey Baptist Association, Fordyce Community and First Baptist Fordyce co-hosted another community outreach event in August they called Impact Fordyce. Ross said they had three goals: share the Gospel of Jesus Christ, meet specific needs of the community, and introduce Fordyce Community to the area. All three were accomplished.